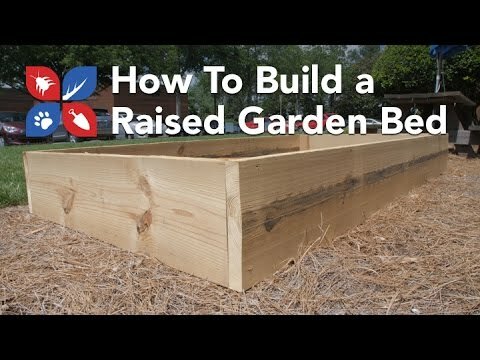 How do you build a raised garden bed to grow tomatoes and other veggies? That is the question Paul will answer in the first video of DoMyOwn.com's new video series! All about gardening! He will answer why you would build a raised garden bed vs. a flat earth bed, where to build, and more! Why am I filming in front of an office building and not at my house? The answer has everything to do with the next video series from DoMyOwn.com. What is that video series? Well it has to do with where that picnic table is. We are going to build a raised garden bed and try to grow our own tomatoes. Now it's going to to one of two ways. It's either going to go really good or really bad. Because I, once again, have no clue what it takes to grow my own tomatoes. Just like the lawn series, however, I have a whole customer service staff that's going to help guide me along the process. We'll lean on them, get their guidance, and we'll see if we can get this to happen. 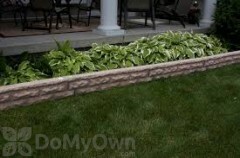 Now why a raised garden bed and why do it right here and not at my house? Let's answer that first question. With a raised garden bed, you can get twice as many vegetables in the same space as you would if you were to dig out the ground and put it at ground level. A raised garden bed will warm quicker, it can be planted sooner, and it will also extend the growing season because it focuses all the soil resources in one area. 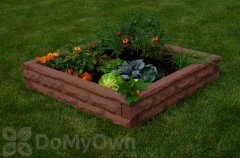 There's a whole bunch of different ways that you can build a raised garden bed. They sell pre made plastic ones that simply snap together in the location that you want. I've heard some people using old pallets to build a raised garden bed; we're going to go really DIY on this; we're going to go to our local lumber yard, buy our own lumber, and build it from scratch. Before we build the garden bed, however, we've got to move this picnic table. What we're going to use, we bought two, two by 12 by 12s. One there, one here. What we're going to do is cut out a four foot section from each board. That will make up our short sides, and that will leave us eight feet from each board to make up our long sides. I've cut out my two four foot sections, leaving me with two long eight foot sections. So we're going to be making a four by eight garden box. I took some scrap two by fours, cut those up into foot long sections. Those are going to be my braces to hold all the corners together. High five to my co-workers for helping me build the box! I stayed away from using pressure treated lumber because I did not want the chemicals getting into my soil and risk harming my plants. The down side to using this lumber, it's not going to last as long as if you were to use a pressure treated lumber. This will last you for a good three to four years versus pressure treated that will last you up to, say ten years. As for the sides of the bed, I went for a full foot. A full 12 inches. You want a minimum of six to eight, because you want the root system of your plants to really get down deep and establishes themselves so that they're nice and strong. The reason we choose to build the bed here instead of somewhere at my house, there's not a really good spot at my house that has eight hours of direct sunlight. This spot right here in front of our office building, we've got that. We've got a minimum of eight, if not more, hours of direct sunlight. The reason we're doing a raised bed versus a standard flat earth bed; we can get twice the vegetable production out of a raised versus a flat. We can also plant our vegetables closer together because we have better control of our soil conditions. And let's talk about that! Soil conditions. With a raise bed we can put whatever we want in there. Gardening soil, organic materials, compost our own, mix up our own soil, put it in there; we have better control of what we're planting in, in a raised bed versus a standard flat bed. Also with a raised bed because we're not walking or stepping in it, we reduce the amount of soil compaction that we have. Soil compaction again will inhibit growth, it will stop oxygen uptake, and reduce the amount of water circulation throughout your garden bed. We have better drainage on our raised bed as well, and that's good because the more drainage we have, the less chances we have of disease or rot setting into our plant. Better air cirulation, better sunshine, and most importantly better water conservation. 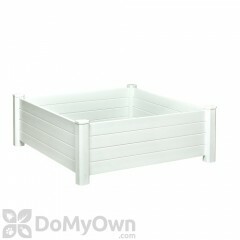 With a raised bed like this, you're only going to water where the vegetables are growing. We do have plans of putting a soaker hose system throughout the bed, and we'll talk about that when we get to that stage. 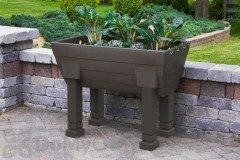 We have easier pest and weed control on a raised bed like this as well. We can build a fence with some netting on it to keep animals or other pests out that we don't want crawling in there. Weeding is much easier in a bed like this as well because we can put more plants in there that will shade out weeds from setting in and if we do have weeds growing in there, it will be easy to pick them out by hand. We can start planting in a raised garden bed like this earlier in the season and later as well, because it warms up and stays warmer then a standard flat earth bed. The lumber and the decking screws that we used to hold it all together, may be cost us a total of forty bucks and while that's an initial cost up front, over time, you're going to end up saving money. What I mean by that is your concentrating all your resources into a smaller area, in our case, a four by eight raised garden bed. There's less mud involved, less clean up, it's all condensed and you get to organize and just make it look esthetically better than you would a standard flat earth garden bed. So there we go, there's the next video series! I'm going to see if I can learn how to grow a small little vegetable garden here in front of our building, and yeah, we'll just see how it goes. I've never grown a garden! I don't know what it takes. I'm going to learn as I go, just like I did with the lawn. We're not done with the lawn series! We're going to keep making videos there. There's still other things that I've got to do in my yard that will hopefully benefit you. But we also want to see what it's going to take to grow a garden. I've never done it before. I'm going to lean on our customer service staff to guide me, give me product recommendations, and tips and tricks on what it takes to grow a garden. Hopefully you'll enjoy this as much as you have the lawn series. We hope you'll follow along by clicking this button to subscribe to the channel. And also go check out those lawn series videos by clicking this play list!